Yes, I’m making up words today. Don’t even try to say them aloud. So far in the 31 Days of Picture Books series I’ve been sharing children’s books I enjoy. Today, I’m sharing about some I don’t. 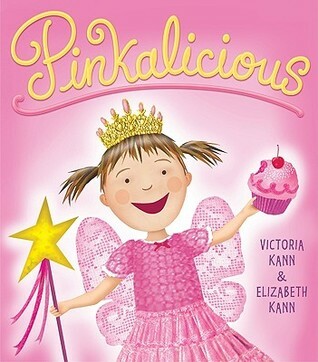 If you have a little girl, you’ve probably seen the Pinkalicious books written and illustrated by Victoria Kann and Elizabeth Kann. The first book is a cute, fun story about a little girl who is a bit too gaga for pink. But after you read it the third or fourth time, you begin to notice how demanding the main character is, how she throws tantrums, how she wants what she wants what she wants, etc. That’s when I start thinking, “I don’t really want to read this book to my children anymore.” I have similar opinions of the other three books I’ve read in the series. They all try to meet typical life situations, (peer pressure, teasing) but the result is usually a resolution of the situation instead of a conquering of the problem. And I guess I just don’t enjoy the writing. Giving a children’s book a bad review is like saying you don’t like Christmas, but my thumbs are down on Pinkalicious and her books. What are your thoughts on Pinkalicious? I totally agree! Did you know she is on the Whiners fantasy football team? Usually quarterback, because she’s so bossy! Ouch. How’s that working for ya’?